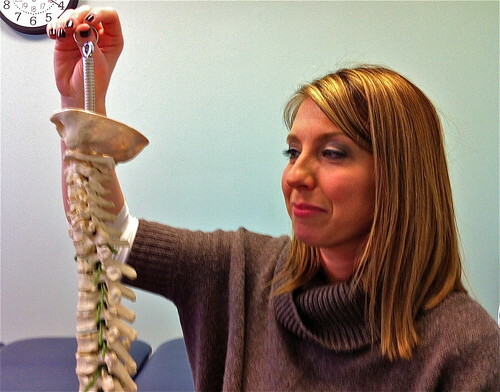 The majority of patients who visit Chestnut Hill Hospital’s physical therapy center at the Top of the Hill come in with spine pain- neck or lower back- according to therapist Bethany Nolan. Lots of tall windows at the facility behind the Children of America building allow natural light to brighten up the large open multi-station workroom area where a few therapists are busy tending to patients. Nolan says the cause of back pain, often, is not a traumatic injury but maintaining prolonged positions like being sedentary too long. With a model of the spine, Nolan demonstrates how pressure can build up in the spine’s discs. Imaging like X-rays is not necessary to begin therapy. An initial evaluation is done and a plan of exercises that can be done at home to reverse the pressure buildup is devised. At therapy sessions she demonstrates the exercises, has patients practice and adjust the exercises and notes the patient’s progress. Exercises may first include just press-ups to ease the pain. Later in the process, core-strengthening exercises like holding the plank position or balancing one’s legs on an exercise ball may be introduced. Nolan stresses the importance of consulting a physician and then working with the therapist to develop a plan of exercises tailored to the patient’s individual needs. “Back pain doesn’t need to be a reason to stop living your life!” Nolan cheerily declaims. 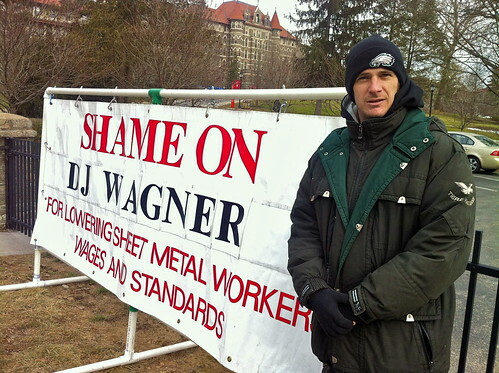 The Sheet Metal Workers Union has been protesting Chestnut Hill College’s use of non-union, Delaware-based contractor DJ Wagner. Eddie Guinan, a sheet metal worker who is manning the picket this day, says Chestnut Hill Hospital, down the street used union workers [for its recent renovations] and that Chestnut Hill College should do the same. The police were called one time and he thinks it was the college’s way of letting the union know that they don’t like the picket. Guinan believes that a college that is charging students $41,000 a year naturally wants the best educated teachers and should also want the best educated- that is, union- workers. Union standards and wages, he says, protect his ability to pay his bills and take care of his family. He contrasts that with non-union workers who may only get only 32 hours, not 40 hours of work a week and without benefits. Guinan works in heating, ventilation and a variety of specialty projects but work has been difficult to find in recent years. He credits the Republicans with doing their best job in the last four years of crushing the unions. NOTE: A comment has been received that the non-union work is being done for the Sisters of Saint Joseph (who run Chestnut Hill College) at their convent. More than a couple months after Hurricane Sandy ravaged the Jersey shore in late October, a teenage girl from Toms River was making a repeat visit with friends to take another look at Seaside Park, the shore town that she would come to every day in the summer to enjoy the beach and boardwalk arcades. It was still hard for her to process all the destruction wrought by the unexpected fierce storm. Her group milled around along with a lot of other curious visitors who were taking photos from the rail of a still standing boardwalk entrance ramp of the expanse of sand where the boardwalk once stood. A lone Coca Cola arch and some battered stores and the now becalmed ocean in the distance completed the vista. The girl and her friends are hopeful that it all will be rebuilt by Memorial Day. Watch video here. 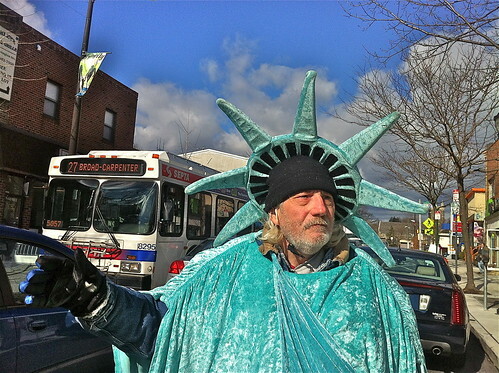 With a shiny turquoise gown and spiked Statute of Liberty hat to match, bearded Tom Humphrey waves at cars passing by on Ridge Avenue in Roxborough to drum up business for Liberty Tax Services. 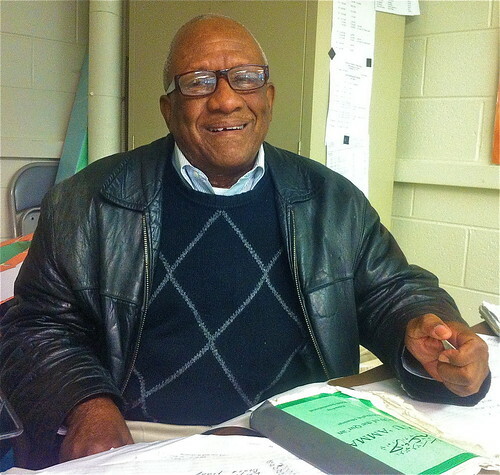 “It’s a fun job,” and he gets to meet a lot of people and see his neighbors, says Humphrey who works four-hour shifts, morning, noon or night, depending on his schedule. Some “wavers” who work other shifts are not so keen on the rainy, sleety or snowy conditions that, he hints, don’t faze him. According to Humphrey, this is Liberty’s signature and effective way of advertising, as the company does not advertise on radio, TV or in newspapers. Watch video here.